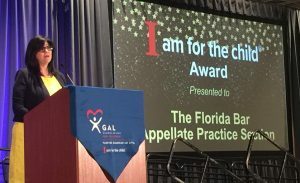 Thomasina Moore, the Director of Appeals for Florida’s Statewide Guardian ad Litem Program, introduces the Florida Bar’s Appellate Practice Section as the recipient of the “I am for the Child” award, the GAL’s highest honor. Appellate Practice Section Pro Bono Committee Chair Joe Eagleton accepted the prestigious “I am for the Child” award on behalf of the Appellate Practice Section at the annual Guardian ad Litem conference on May 3, 2018. 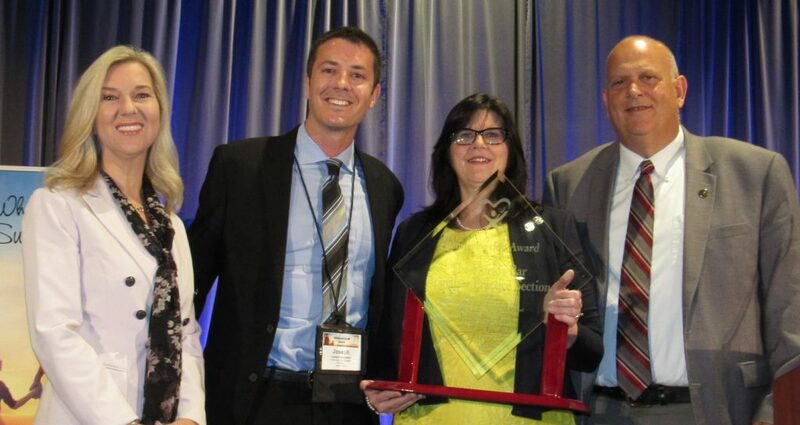 This award, the highest honor from the Florida Statewide Guardian ad Litem program, was given to the Section in recognition of the more than 1000 hours of pro bono time section members have donated to the Guardian ad Litem’s office over the past year. Because of this, the Defending Best Interests project lead by Section Member Thomasina Moore has permitted the Guardian ad Litem Office to take on an additional 475 children. Many thanks to Ms. Moore, Mr. Eagleton, and the Section’s Pro Bono Committee for their hard work and commitment to this program. Anyone interested in appellate pro bono opportunities should send an email to Mr. Eagleton at jeagleton@bhappeals.com. The Florida Statewide Guardian ad Litem Program presents the “I am for the Child” award to the Florida Bar’s Appellate Practice Section. From left to right: Neiko Shea, GAL Foundation Board Member; Joe Eagleton, APS Pro Bono Committee Chair; Thomasina Moore, Director of Appeals for the GAL Program; Alan Abramowitz, Executive Director of the GAL Program.